Made in Britain ......... 2012 is yet another year full of reasons to celebrate for Lyte Ladders & Towers. This year sees the celebration of 10 years of manufacturing aluminium mobile access towers in addition to the long standing manufacture of ladders and steps ladders. 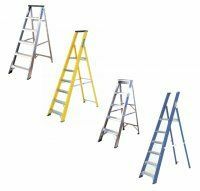 Established in 1947, Lyte Ladders & Towers has developed an excellent reputation for manufacturing and supplying a large range of high quality domestic, trade and industrial steps, ladders, towers and bespoke access equipment to many large blue chip companies. The Belle Group is an established manufacturer of light equipment for the Building and Construction markets. Based in the Derbyshire Peak District. In 2009 the company became part of the Altrad Group, with its head quarters in Montpellier, France. -Compacting : Forward, Reversible plates, Trench rammers and Walk behind rollers. -Mixing : Electric stirrers, Portable and Compact mixers, Large capacity mobile and site mixers. -Concreting : Pokers, Flexible shaft pump, Screeds, Trowels and Finishing tools. -Cutting : Floor saws, Tile saws, Bench saws, Block splitters and Diamond blades. -Breaking : Hyraulic breakers, Hydraulic packs and tools. -Wheelbarrows : Belle, Fort, Limex & Richard Wheelbarrows. A European Manufacturer of a full line of Light construction products, with its own production site in England. Welcome to fischer fixings UK! fischer is one of the World's largest fixings manufacturers. created using a wealth of experience from the industry. Everbuild Building Products Ltd is the UK & Ireland's largest independent manufacturer of sealants, adhesives, fillers and building chemicals.